Today we’re excited to share that Playtonic have just updated Yooka-Laylee with the 64-bit tonic on Steam and Nintendo Switch. This takes the epic nostalgia to whole new levels, as our favourite platforming heroes can now be enjoyed in glorious 64-bit, just like the games of “old”. To get the brand new and completely free 64-bit tonic, simply update your game on Steam or Nintendo Switch and meet Vendi in-game! 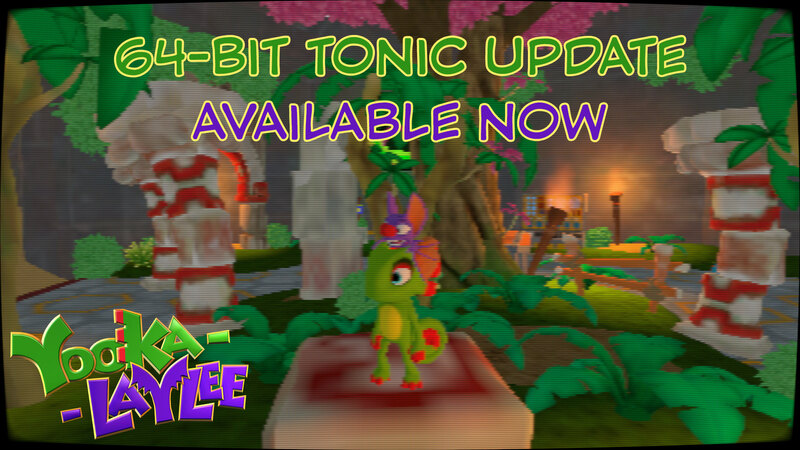 The free 64-bit tonic update will be making its way to PlayStation 4 and Xbox One at a later date. Stay updated on all the latest news from Team17 by following us on Facebook and Twitter, joining our Discord server, and subscribing to our newsletter.